On this beautiful day, I thought I’d post a recipe I recently shared with greatideas.people.com, adding in the more health-conscious option. When cooking for company, I use butter, but when making a weekly breakfast loaf for my family, I like to make some heart-healthy substitutions. I know spring has arrived in my garden when I look outside my window to discover my Meyer Lemon tree ready for picking. Meyer Lemons are the plain-Jane variety’s more floral, less acidic sister – perfect for squeezing into baked treats, like my Meyer Lemon Cake with Lavender Sugar. Spring and summer mean many a garden party, and this recipe is my favorite to bring along for the host. Wrap your loaf in burlap and tie with twine. The sweetly sophisticated flavor, and unfettered presentation, will have the party talking – and wanting more! I took the first loaf of the season to a party last weekend, and let’s just say parents were fighting their children for the last crumbs…I recommend doubling the recipe. For my Lavender Sugar recipe, see last week’s post! 1. Heat oven to 350°. With non-stick spray, coat a loaf pan measuring 8 ½” x 4 ½” x 2 ¾.” In a bowl, mix together flour, baking powder, and sea salt. In another bowl, mix together buttermilk, lemon juice, zest, and vanilla. Set both mixtures aside. 2. Cream the butter and sugar in a bowl with an electric mixer until fluffy, about 3 minutes. Add the eggs, one at a time, beating until combined. Add half the flour mixture, alternating with the buttermilk mixture. Beat until consistent. Fold in the ground almonds. Pour batter into loaf pan and bake, about 55-60 minutes. Total Prep Time: 20 mins. Total Cooking Time: 1 hr. 1. Heat oven to 350°. With non-stick spray, coat a loaf pan measuring 8 ½” x 4 ½” x 2 ¾.” In a bowl, mix together flour, baking powder, and sea salt. In another bowl, mix together yogurt, lemon juice, zest, and vanilla. Set both mixtures aside. 2. Cream the butter and sugar in a bowl with an electric mixer until fluffy, about 3 minutes. Add the eggs, one at a time, beating until combined. Add half the flour mixture, alternating with the yogurt mixture. Beat until consistent. Fold in the ground almonds. Pour batter into loaf pan and bake, about 55-60 minutes. 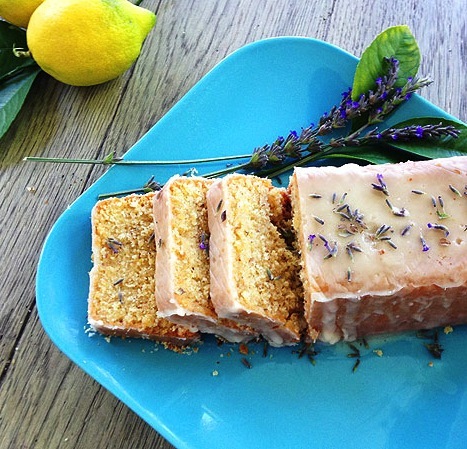 Where can you find lavender sugar?